Cairns is a lovely city surrounded by the reef on one side and the rainforest on the other. Our Chabad House is in the "suburbs" of cairns called "the northern beaches". The northern beaches are renown for their incredible beaches that are somewhat secluded being that they are not in the main city. They are a lot quieter and often cheaper to stay in than the city. Many more people are opting to stay in the northern beaches rather than the city. There is easy access to the city by the public transport system and car rentals are very reasonable as well. The northern beaches are divided into a few sububs. The main tourist suburbs are Trinity Beach and Palm Cove. Our Chabad House is between the two in a Kewarra Beach. The closest options are airbnb's in the area see below for listings. The hotels in Trinity beach are all walking distance to us (20-30 min). There is one resort in Kewarra beach but it is pretty pricy. 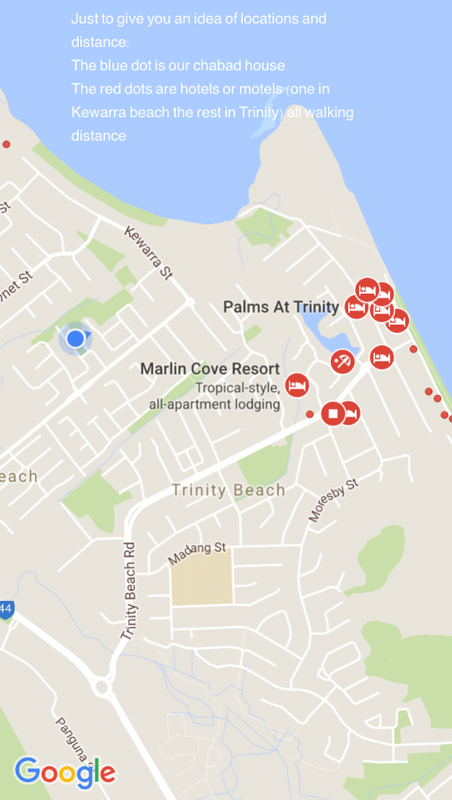 If you put Trinity Beach or Kewarra Beach in any of the Hotel/Motel search engines you can judge the distance to us. All paths take you from Beit Chabad to Trinity Beach Rd which is the main Road of Trinity Beach. From there use Google maps to see which one may be easier for you. The Green Path goes through Nova st. park which separates Trinity to Kewarra. The Red and Blue paths use the Sporting Precinct paths of Trinity Beach. The Red one takes you behind the sport fields and the Blue one uses the path in between sections.